Biography of Edgar C. Thompson, CCCman, Co. 399 Neffer Mills, Unknown State, Camp SS-22, Unknown location, Camp in Huntington Pa, Co. 2358, Camp SCS-7 South Hills, Va.
CCCman, Co. 399 Neffer Mills, Unknown State, Co. 2358, Camp SS-22, Unknown location, Camp in Huntington Pa, Camp SCS-7 South Hills, Va.
My father Edgar C. Thompson went in the CCC in 1934 in Pittsburgh Pennsylvania. From there he went to Fort Hoil, Maryland. He also served in Camp SS-22, Unknown location and a Camp in Huntington Pennsylvania. He spent some time at Company 399 at Neffer Mills but I do not know which state that was located in. He also served at Camp SCS-7 with Company 2358 in South Hills, Virginia in August of 1935. 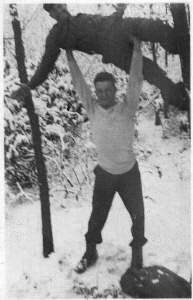 One day the boys of camp S-60-Pa.(near Whipple Dam south of Penn State) were fooling around with a hatchet. Wearing a blindfold, the game was to chop a small wood chip sitting on top of a block. Four or five guys tried. Now it was up to a big boy they called Tarzan. Anyway Tarzan steps up, takes off his hat, puts the blind fold on, raises the hatchet. Then, Wack! down it comes. He took off the blindfold to see if he hit the chip. There in the center of the block was his hat stuck tight right where the guys had put it. The laughing came from a safe distance. Remember Tarzan with the ax stuck in his hat? The barbell is a guy called Porky. I have not yet found Porky`s real name but Tarzan is in the autograph book under the name Mike Malvician, 101 W. Railroad St. Nesquehoning Pa. These pictures were taken between 10/10/34 and3/31/35 at Camp S-60-Pa. I took a trip to Meadville Pa. a few weeks ago to see my Dad. I had found Whipple Dam on the map. It`s about 20 miles south of State college. I got off I-80 and drove to what is now a small State Park. As I pulled Into the parking area I could see the lake and the dam. There is a small swimming area, tables and a few buildings. I got out and walked toward the lake. I saw a small stone base with a wooden sign on top. It commemorates the men of CCC camp S-60 I took a few pictures of it . I walked around and took some more pictures. It`s a really beautiful place. I didn`t have time to explore and I didn`t see any ranger or anyone who could say where the actual Camp was located. I told my Dad about my visit to the place he helped build. He said that the camp wasnt far up one of the trails from where I was. He said they used to get on Army trucks and go in to a town south of there called Huntingdon ,Pa. They could go to movies and hang out with the locals. I want to go back there some day soon but My trips to Meadville have been pretty much out and back, with no time to stop. My Dad was in his final few days when this page was first put up. Dad passed away October 13, 1999. He had a great life. He didn`t start with much but I think He was able to build on the lessons and skills he learned in the CCC. I would like to know more about any of these camps and locations and any names of men who may have served at these places. Thank You.